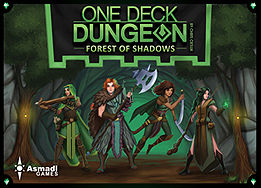 One Deck Dungeon: Forest of Shadows is a co-operative dungeon delve for one or two players. It is a stand-alone expansion, so it can be played entirely on its own, but can also be mixed with the original One Deck Dungeon. With any two sets combined, you can play as a party of four heroes.